The 2016 presidential campaign has in many ways become a question of character. Even though Hillary Clinton and Donald Trump both have incredibly loyal supporters, the two candidates also inspire some intensely negative feelings among voters. Clinton and Trump are the two most unpopular candidates since modern polling began. NPR's Rachel Martin hosts an hourlong special that digs into key moments over the decades that helped cement their reputations and looks at character traits that have turned into liabilities with voters. For Clinton, it's the way she seems to protect her privacy at all costs. For Trump, it's how he seems to crave public attention and says almost anything to get it. MARTIN: Hi. I'm Rachel Martin from NPR News and over the next hour, we're going to take a close look at the two major party presidential candidates. Specifically, we're going to try to understand why this election has become a question of character. You've heard this before. Hillary Clinton and Donald Trump are the two most unpopular candidates in modern history. Having said that, it's important to point out that both Clinton and Trump have some incredibly loyal supporters, voters who believe strongly that their candidate is a great leader and someone who would take this country in the right direction. But the negative feelings voters express toward both Hillary Clinton and Donald Trump are intense. (UNKNOWN): Donald Trump is kind of like Kim Kardashian, just dumbing down America. (UNKNOWN): I despise that man. (UNKNOWN): I think of a bigot. (UNKNOWN): He's a spoiled, privileged brat. (UNKNOWN): Hillary Clinton, I think of illegal activities. (UNKNOWN): The lack of integrity, all of that lying and contradiction. (UNKNOWN): Scorned, but strong female. (UNKNOWN): Seems like a terrible human. MARTIN: That was a small sample of voter sentiment from around the country. We're going to try to figure out what is behind those characterizations. CLINTON: I get it that some people just don't know what to make of me. (UNKNOWN): Mr. Trump, you're not a nice person. TRUMP: I think I am a nice person. People that know me like me. MARTIN: Over the course of this hour you'll hear from some of the people who have worked closely with them. Here's British TV journalist Piers Morgan. MORGAN: I've interviewed him 30 times. I spent maybe 200 hours doing Celebrity Apprentice in his company, and you underestimate this guy at your peril. MARTIN: And we'll hear from some who know them best. This is Chelsea Clinton. CHELSEA CLINTON: Growing up and really kind of watching my mom in the arena, I've — I don't remember a time when she wasn't attacked. MARTIN: We will take you back to their childhoods to explore their most formative experiences. And we'll try to understand some of the character traits that push voters away. For Clinton, it's the way she seems to protect her privacy at all costs. HILLARY CLINTON: The server contains personal communications from my husband and me. And I believe I have met all of my responsibilities, and the server will remain private. MARTIN: For Trump, it's how he seems to crave public attention and says anything to get it. TRUMP: They say I have the most loyal people. Did you ever see that? Where I could stand in the middle of Fifth Avenue and shoot somebody and I wouldn't lose any voters, OK? It's like incredible. 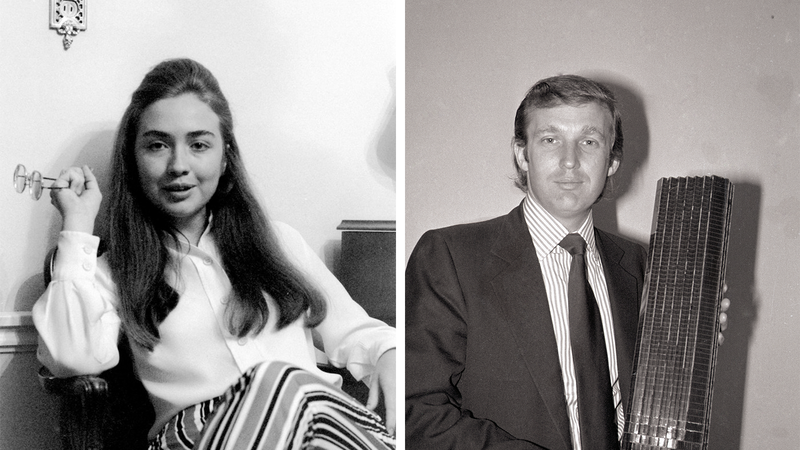 MARTIN: But before we get to the now, we're going to spend some time in the wayback, because as young people Hillary Clinton and Donald Trump stood out from their peers. We'll start with Donald Trump, who even as a young kid was the center of attention. He was known for goofing off, and sometimes he broke the rules. Gwenda Blair wrote a book about the Trump family. BLAIR: He and his best friend liked to sneak over to Manhattan on the subway. And once when they went there they got some jackknives which — or actually switchblades, not just jackknives — which evidently they thought were pretty cool since they had just seen West Side Story. MARTIN: His parents didn't think it was so cool and they sent him to military school. NPR's Ailsa Chang talked to some people who knew Donald Trump back then. CHANG: What Donald Trump was famous for before military school was breaking the rules. This kind of stuff was embarrassing for Trump's well-to-do parents in Jamaica Estates, Queens. So before eighth grade, his father sent him literally up the river to New York Military Academy in the Hudson Valley. Col. Ted Dobias remembers the tall, lanky kid who showed up at this dormitory. DOBIAS: He didn't know how to make a bed. He didn't know how to shine his shoes. He had a — he had a problem, you know, with being a cadet. You know, being a cadet you got to take care of yourself. CHANG: But instead of recoiling from the discipline, Trump thrived under it. Mike Kabealo, a classmate, says in the confines of these rigid rules Trump wanted to be a standout. KABEALO: Cocksure, positive and anything-you-can-do-I-can-do-better kind of stuff, you know. He was very competitive. CHANG: And friends say Trump channeled that competitiveness into everything at military school. When he was in charge of the rifle rack, he cleaned the rifles obsessively. He was meticulous about his uniform. When it was his turn to do inspections in the barracks, he whipped other cadets into shape. Ted Levine was Trump's roommate. LEVINE: My bed wasn't really made right and he ripped it. CHANG: Trump tore Levine's sheets right off. His bed hadn't passed muster. LEVINE: Then I lost it. I totally lost it. So I think I hit him with a broomstick and he came back at me and, no, with his hands. He was bigger than me and it took three people to get him off me. CHANG: Levine was 4 foot 11, Trump 6 foot 2. In the pecking order of young boys that size gave him authority. Trump became captain of the baseball team and Col. Dobias was his coach. DOBIAS: He was very coachable, yes. If I told him, "Do this," he'll do it. He accepted criticism. He wanted to be best, not better. CHANG: And then there were the girls, so many girls visiting on Sundays. Classmate George White still cannot forget them. WHITE: There were so many, it was a revolving door. CHANG: Trump was voted "Ladies' Man" in his senior yearbook. His friends say he cared about his hair even then, growing it to the maximum length regulations would allow so it would look fuller. And Trump had this way of laughing when others spoke. It used to get on White's nerves. WHITE: It made you feel like he was separating himself from you. It made you feel like there was an air of superiority, just enough of a signal that he was laughing at you. CHANG: As his roommate Levine says, maybe it was that quality that made it difficult to get close to Trump. LEVINE: I don't think he had a handful of loyalists, you know, because he was so competitive that everybody who could come close to him he had to destroy. CHANG: But now, 50 years later Levine says he and the other guys still kind of admire Trump. Today Levine's office is littered with Donald Trump knickknacks like this talking doll. Sometimes, Levine says, that Donald gives him guidance about how to run his packaging business. [to Levine] Wait, wait, wait, so you really squeeze this doll for advice? LEVINE: Once in a while, yes. It's reinforcement, positive reinforcement of true values that are very important for businessmen. TRUMP: Never give up. Under any circumstances, never give up. MARTIN: So that's what Donald Trump was like as a young competitor. A young Hillary Rodham had the same kind of drive, but instead of sports, she was into politics. She was on the student council at her high school in Park Ridge, Ill. And she decided to run for class president even though it was a risky move. Her high school friend Judy Price describes it this way. PRICE: The president was always a boy and the secretary was always a girl. MARTIN: But Hillary Rodham thought she could win. Her friend Betsy Ebeling explains. EBELING: I was her campaign manager so I advised her that probably. That one didn't turn out so well. MARTIN: She lost. She was still a student leader, though, putting together the homecoming dance, prom and pep rallies. Hillary Rodham headed to college as a Republican and in her freshman year at Wellesley she was elected president of the Young Republicans Club. She was a Democrat by the time she graduated. CLINTON: The question about possible and impossible was one that we brought with us to Wellesley four years ago. MARTIN: That is the voice of a young Hillary Rodham. It was 1969 and she was giving her college commencement address. CLINTON: We arrived at Wellesley and we found, as all of us have found, that there was a gap between expectation and realities. But it wasn't a discouraging gap and it didn't turn us, you know, into cynical, bitter old women at the age of 18. It just inspired us to do something about that gap. MARTIN: This speech put Hillary Rodham on the national stage for the first time and it came during a tumultuous chapter in American history. Here's NPR's Tamara Keith. KEITH: The class of '69 had been through a lot together. By the time they were set to graduate, the Vietnam War and protest against it were in full swing. College campuses had become centers of activism and conflict. And both Martin Luther King Jr. and Bobby Kennedy had been assassinated. Hillary Clinton wrote in her book Living History about fretting over the speech. Alan Schechter was her professor and college government adviser. SCHECHTER: Hillary had read the speech to me beforehand and I thought it was a perfect example of youthful idealism at the time. KEITH: But the speech Rodham read to Schechter is only part of what she delivered at the commencement ceremony. And it's the part that wasn't planned that drew all the attention. The special guest speaker that day was Sen. Edward Brooke, a moderate Republican from Massachusetts and the first African-American popularly elected to the U.S. Senate. His speech celebrated incremental progress and spent a lot of time arguing against protest. He said, quote, "Coercive protest is wrong, and one reason it is wrong is because it is unnecessary." When she stepped to the lectern, Rodham didn't go directly to her prepared remarks. CLINTON: I find myself in a familiar position, that of reacting, something that our generation has been doing for quite a while now. We're not in the positions yet of leadership and power, but we do have that indispensable element of criticizing and constructive protest. KEITH: She was reacting to Sen. Brooke's speech. CLINTON: This is just — it has to be very quick because, you know, I do have a little speech to give. But part of the problem with just empathy with professed goals is that empathy doesn't do us anything. We've had lots of empathy. We've had lots of sympathy. But we feel that for too long our leaders have viewed politics as the art of the possible. And the challenge now is to practice politics as the art of making what appears to be impossible possible. KEITH: And when it was over, she got a standing ovation, from her classmates at least. Schechter says not everyone was so pleased with Rodham's performance. SCHECHTER: The administration was not happy afterwards or at least some people were not happy, because they felt it was inappropriate for a student to criticize the commencement speaker. KEITH: It made papers across the country. The Chicago Tribune wrote, quote, "Miss Rodham's discourtesy to Senator Brooke was unjustified." And this all led to Rodham's inclusion in a spread in Life magazine about the class of '69. Time, which owns the Life magazine archives, dug up some notes from the photographer and reporter who worked on the story. Rodham said press accounts of the speech weren't accurate and she was, quote, "quite concerned that it be made clear she was not attacking Sen. Brooke personally." It would seem Hillary Clinton's first moment in the limelight was also the beginning of her difficult relationship with the press. MARTIN: After this break, we'll explore how Hillary Clinton has struggled with the public nature of her political life. And later Donald Trump's affinity for the spotlight and his unwavering faith in his own instincts. Hi. I'm Rachel Martin and we're back with a special broadcast from NPR News on character in this year's presidential campaign. We just heard about what set Hillary Clinton and Donald Trump apart from their peers when they were young. Coming up, we'll look more closely at Donald Trump and his desire for public attention. For now, we're going to focus on Hillary Clinton and signature moments that came to define her in the eyes of the nation. And you can't start to understand who Hillary Clinton is as a public figure without examining her role as Bill Clinton's wife. CLINTON: The famous encounter occurred in the law school library. CLINTON: I don't know. You know those moments, you know, sort of like click. MARTIN: The Clintons have told this story time and again over the course of their political life. CLINTON: If you're going to keep looking at me and I'm going to keep looking back, we at least ought to know each other, and I'm Hillary Rodham. CLINTON: And what's your name? I couldn't remember my name. MARTIN: And it's an appropriate starting off point in examining Hillary Clinton's past because after she met and fell in love with Bill Clinton her career, her aspirations and public persona were inextricably linked to his. David Maraniss of the Washington Post has been reporting and writing about the Clintons for decades. MARANISS: From the time they met I would say that they saw that they could get places together that they couldn't get to apart, that their talents matched in an interesting way. And she was the harder worker, the more of the pragmatist, and he had this raw preternatural political talent that she lacked. But they shared an interest in books and policy and ideas and in a notion that together they could change the world. MARTIN: They started in Arkansas and in 1979, Bill Clinton became one of the youngest people ever to be elected the governor of a state. And as his wife, Hillary Rodham was under a whole new level of scrutiny. Here she was, this product of Northeastern liberal universities, a woman who didn't use her husband's name trying to fit in as the first lady of a conservative Southern state. This was part of an interview she did in 1979 on Arkansas public television. (UNKNOWN): Does it bother you that because you don't use your husband's name that people think you're too liberal and, after all, this is not a state known for liberalism? CLINTON: Too bad. Some people may think I'm, you know, too this or too that. But I think that's another one of the dangers about being in public life. One cannot live one's life based on what somebody else's image of you might be. All one can do is live the life that God gave you and, you know, you just do the best that you can. And if somebody likes you or doesn't like you, that's really, in many ways, something you have no control over. MARTIN: It was an early moment in Hillary Rodham's contentious relationship with the press and the public. She didn't fit what a political spouse was supposed to be and felt a certain push and pull between what was expected of her and her own professional identity. She was a partner at a prestigious law firm in Little Rock. She had championed children's issues for years. By the time Bill Clinton ran for governor for a third time in 1982, she added her husband's name to hers. That served her well in Arkansas. But her discomfort being a traditional political spouse was again on display in 1992, this time on a national stage when Bill Clinton ran for president. In that campaign, he was accused of using the governor's office to help his wife's law career. Hillary Clinton characterized those attacks as a slam on professional women. CLINTON: You know, I suppose I could have stayed home and baked cookies and have teas. But what I decided to do was to fulfill my profession which I entered before my husband was in public life. MARTIN: Feminists cheered, but to the many women who were full-time mothers and homemakers at the time, the comment came off as patronizing and smug. It was not the first time she had offended traditional notions of a woman's place. The Clinton's were redefining what marriage and partnership look like in politics and they were doing it in public. STEVE KROFT: I'm Steve Kroft and this is a special abbreviated edition of 60 Minutes. Tonight Democratic presidential hopeful Gov. Bill Clinton and his wife, Hillary, talk about their life, their marriage and the allegations that have all but stalled his presidential campaign. MARTIN: Allegations of infidelity. The Clintons sat down for one-on-one with Steve Kroft of 60 Minutes. KROFT: I think most Americans would agree that it's very admirable that you've stayed together, that you've worked your problems out, that you seemed to have reached some sort of understanding and an arrangement. CLINTON: Wait a minute, wait a minute, wait a minute. You're looking at two people who love each other. MARTIN: It was an uncomfortable conversation as the Clintons tried to put those allegations to rest. HILLARY CLINTON: This is not an arrangement or an understanding. This is a marriage. That's a very different thing. You know, I'm not sitting here, some little woman standing by my man like Tammy Wynette. I'm sitting here because I love him and I respect him and I honor what he's been through and what we've been through together. And, you know, if that's not enough for people, then heck, don't vote for him. MARANISS: By the time they started to run for the presidency, Hillary Clinton had made her bargain. MARTIN: Again, journalist David Maraniss. MARANISS: She knew Bill Clinton's history and she decided that what they could do together in terms of policy was far more important than his personal flaws. And because they were so closely tied together in their eyes, she had to defend him. And I would say that that aspect of her character has really shaped much of her — the sort of critique of her public persona ever since. She, for almost 40 years in her relationship with Bill Clinton, has been defensive. MARTIN: And being on defense has meant trying to tightly control public access to what she considers private. The problem is that what Hillary Clinton has characterized as a need for privacy, her critics have described as a pattern of secrecy. That's what happened in the so-called Whitewater scandal, which erupted during Bill Clinton's first term in the White House. (UNKNOWN): The tangled relationship between an Arkansas land deal, a savings and loan and Hillary Rodham Clinton's former law firm is again under scrutiny today. MARTIN: It became a central part of a federal investigation. In the end, Bill Clinton's political opponents couldn't prove that he or Hillary did anything illegal in that real estate deal. Even so, David Maraniss says it did political damage. MARANISS: It all became sort of part of this stew of Clinton misdeeds or apparent misdeeds in that period. MARTIN: Maraniss says Hillary Clinton refused to release key documents related to that case over to investigators. MARANISS: There was a recommendation by several advisers that the Clintons just give the public everything, you know. And it was a discussion actually with my newspaper, the Washington Post, about that when we were asking for records. And it was Hillary and the White House who said, no, don't ever give that up. MARTIN: Because the White House wouldn't hand over certain documents, a second special investigator, Kenneth Starr, started asking more questions. And at the urging of some on Capitol Hill, the investigation into the Clintons broadened. After four years, it would eventually lead Kenneth Starr to a young White House intern named Monica. BILL CLINTON: I did not have sexual relations with that woman, Ms. Lewinsky. I never told anybody to lie, not a single time, never. These allegations are false and I need to go back to work for the American people. Thank you. MARTIN: The day after that now-famous television address in 1998, Hillary Clinton did her own damage control. She went on NBC's Today show and said this. HILLARY CLINTON: The great story here for anybody willing to find it and write about it and explain it is this vast right-wing conspiracy that has been conspiring against my husband since the day he announced for president. MARTIN: It would be more than six months before President Bill Clinton acknowledged that he did indeed have sexual relations with that woman. MARANISS: You know, with the Clintons a lot of things are true and false at the same time. MARANISS: It's part of the complexity of their — of their place in American politics. And so whether it was an actual conspiracy or not, it is irrefutable that the right wing was more agitated by the Clintons and more prone to go after them in any way whether something was accurate or not, than any other Democratic politicians. And so by the time, you know, the Monica Lewinsky story broke and Hillary sort of rallied the troops and came to his defense and went on the Today show and issued that statement and was really the strongest person in the White House during that crucial period when some, you know, many people were saying that Clinton would have to resign, it was Hillary that was actually the steel there. MARTIN: It was in part her steely resolve that made it difficult for the American people to warm to her as first lady throughout all her years in the White House, again, because she was redefining what that role was. Yes, she oversaw the Christmas decorations at the White House and hosted state dinners, but Hillary Clinton also had a lot of power from the beginning when her husband put her in charge of health care reform. She was an important policy adviser. MELANNE VERVEER: I think it can best be summed up by the phrase, "Who elected her?" MARTIN: This is Melanne Verveer. She was Hillary Clinton's chief of staff when she was first lady. Verveer remembers when the president tapped Hillary to lead the push for health care reform in 1993. And there were a lot of people asking this question. VERVEER: Who elected her to come in and have this kind of power over a significant part of the U.S. economy, at least in terms of what health care represented? MARTIN: Did you hear that kind of frustration or criticism internally as well, who elected her? VERVEER: Well, I think internally as there always is and I've compared notes with my confreres who've been in this position both on the Republican side and the Democratic side, there is often a lot of flack from the West Wing, as we call it, where the president's closest staff work. And I think there probably was a sense of, you know, this may not have been the right move. MARTIN: Hillary Clinton was still the first lady when she ran for public office herself. In 2000, she won her Senate race in New York. HILLARY CLINTON: And I just want to say from the bottom of my heart, thank you, New York. MARTIN: In Congress, she seemed more comfortable than she ever had been as a public figure, because for the first time she was the politician. The decisions she had to defend were her own. She dug into the work and won respect from Democrats and Republicans. JUDD GREGG: She was a hardworking liberal senator who had strong opinions but who also understood that she didn't get anything done unless she worked across the aisle. MARTIN: We called up former Republican Sen. Judd Gregg from New Hampshire and asked him if the public critic of Hillary Clinton in this election was evident back then. (UNKNOWN): In this election, she has admitted that she's had some problems with trustworthiness, that that seems to be a word that voters, when polled, say is a problem. Did you find her to be an honest broker? GREGG: Oh, there's no question she was an honest broker in the Senate. She — if you talk to her on issue, she told you what she thought, she tells you what her position was and that's the way you have to do things in the Senate. Your word is your bond in the Senate. If you don't live by your word in the Senate, you're not going to get anything done. MARTIN: Yet time and again Hillary Clinton has had problems convincing the American public that she's trustworthy. Here she is at a campaign event in Chicago this summer. HILLARY CLINTON: You can't just talk someone into trusting you. You've got to earn it. So, yes, I could say that the reason I sometimes sound careful with my words is not that I'm hiding something, it's just that I'm careful with my words. I believe what you say actually matters. I think that's true with life and it's especially true with your president. So I do think before I speak and I could say that political opponents and conspiracy theorists have accused me of every crime in the book over the years. None of it is true, never has been. But accusations like that never really disappear once they're out there. CHELSEA CLINTON: It never made sense to me why more people don't see the person that I love and know so well. MARTIN: Chelsea Clinton has been trying to understand this disconnect for a long time. CLINTON: My earliest political memories really come from 1986 when my dad was running for re-election as governor of Arkansas and he was running against a man named Frank White who had been governor of Arkansas before and he spent much of the campaign although he's running against my dad, attacking my mom. And I remember this so vividly I think because one of his lines of attack was against her as a mother. She must be a terrible mother because we see her working as a lawyer. She must spend all her time kind of in her office or in the courtroom. And it just all seemed kind of crazy to me because I was an only child and so I thought, kind of my opinion about my mom should matter a lot more than Frank White's opinion about my mom. And, you know, he kept saying that she must never be there, but I knew that she was there all the time. I mean she was home for every dinner. She never missed any of my soccer games or my little ballet recitals. And so my entire life there's been this cognitive dissonance between kind of the public characterization of my mother particularly from my parents' political opponents and my lived experience with her as my mom. (UNKNOWN): You no doubt have observed the polls that say there are still a large number of Americans who don't trust your mom. That obviously must be hard for you to hear as her daughter, but how do you reconcile that? CLINTON: On a fundamental level, it doesn't make sense to me because the person that I know and love is the person that, outside of my husband, I trust most to take care of my children. On the larger question, you know, as you said in the question that you asked, my mom has acknowledged that she has work to do and she's actively engaged in that work in this campaign of trying to earn both Americans' votes but more importantly their trust and confidence in her ability to be our next president. MARTIN: It might not make sense to those who are close to her, but critics outside the Clinton inner circle, they see a pattern of behavior, a lack of transparency that makes it hard to sort the political hit jobs from the ethical missteps. Let's take the most recent example. (UNKNOWN): Secretary Clinton was interviewed today in the ongoing investigation into whether classified information was mishandled when she chose to use a private server during her time at the State Department. MARTIN: In early 2015 during the ongoing Benghazi investigation it came to light that Hillary Clinton used a private email address and a private email server during her tenure as secretary of state. The director of the FBI said there was nothing illegal about that, but he also said there is evidence that Clinton and her staff were, quote, "extremely careless" in their handling of very sensitive, highly classified information. That alone has been a political minefield for the Clinton campaign. But so have emails found in that server, messages that have shown that then-Secretary Clinton held meetings with donors to the Clinton Foundation. Critics say she used her position to grant favors to those donors. Bill Clinton biographer David Maraniss says this whole episode fits into a perceived pattern. MARANISS: At many key points it was Hillary who was the most protective and the least transparent. (UNKNOWN): How have these attacks, and especially the accusations of secrecy, how have these all stuck to Hillary Clinton in a way that they haven't stuck to Bill Clinton? And they seem to, they seem to adhere to her in a way that he shakes off. MARANISS: Yes. No. I think there's a lot of reasons for that; one is sexism. I think that's undeniable that as the strongest woman figure in American politics, in modern American politics, she is susceptible to more criticism for things that [others] might not be criticized for. I don't think that's all of it by any means, but I think it's foolhardy to not take that into consideration. Another aspect is that Bill Clinton is just purely — I mean this in a complimentary way to Hillary, but I've sometimes called Bill Clinton an authentic phony and Hillary Clinton a phony phony. In other words, Bill Clinton is better at presenting himself in his many different ways. He's a Protean character who when it comes into a room can be whatever that room wants him to be. And Hillary is not as adaptable as that and so that leads — she's less fluid in her political style and that leaves her open to more of these criticisms. And so over the course of time I think that that's built up this public perception of her. Now, the question to me now is whether now that she's on the verge of actually reaching this incredible position, whether that will liberate her from that protectiveness, whether, you know, she doesn't need Bill Clinton anymore. MARTIN: While Hillary Clinton has struggled with the public nature of her life, Donald Trump has thrived on it. More on that coming up. Stay with us. Welcome back. I'm Rachel Martin and you're listening to a special broadcast from NPR News about the question of character in his year's presidential election. We just heard a range of perspectives on Hillary Clinton and her character, who she is as a mother, a politician and a colleague and how her need for privacy has been a political liability over the years. On the other side of this election is a man who is more than comfortable in the public eye. TRUMP: You've been lazy, you've been nothing but trouble and now you cut them off as they're fighting each other for who should be fired. MARTIN: There has never been a presidential candidate like Donald Trump. He is a rich real estate tycoon who became an NBC reality TV star. He has no political experience and has run a presidential campaign based almost exclusively on his personal charisma and ability to grab headlines. Hyperbole is part of his style, but that gets him into real trouble on the campaign trail. TRUMP: ISIS is honoring President Obama. He is the founder of ISIS. He's the founder of ISIS, OK? He's the founder. They're bringing drugs, they're bringing crime, they're rapists. MARTIN: Each time Trump has said something provocative in his presidential campaign, his followers have not been deterred. This is British TV journalist Piers Morgan. MORGAN: The turning point for me actually was when he was able to denigrate John McCain for his war record by saying I prefer my war heroes not being captured. TRUMP: He's not a war hero. (UNKNOWN): He's a war hero. (UNKNOWN): Five and a half years (inaudible). TRUMP: He's a war hero because he was captured. I like people that weren't captured, OK? MORGAN: And he got away with it. MARTIN: Morgan has been friends with Donald Trump for the past decade. And he says Trump supporters did not flinch after that dig at John McCain. MORGAN: That was a moment that could have ended many campaigns stone dead, and it showed me that Trump's uniquely personal style was actually resonating with the public in a way that people didn't anticipate. (UNKNOWN): He is a man of remarkable confidence. I think that's probably an understatement. MORGAN: Yes, of the millennium, yes. (UNKNOWN): But to be as successful as he has been, I would — I would pose it that you have to be able to see your blind spots. Do you — as someone who knows him, does he have that capacity? Does he recognize where he falls short? MORGAN: He believes that it's weak to constantly apologize and constantly backtrack and he believes it's strong to stand by your opinions however unpalatable they may be to other people. And regardless of what people think of him and that style perhaps of campaigning, it is the demonstrably, hugely successful for him. MARTIN: To figure out where that confidence comes from, we called up Gwenda Blair. She's the author of a book called The Trumps: Three Generations of Builders and a Presidential Candidate. Blair says it was clear from early on that Donald would be his father Fred Sr.'s successor, not his older brother Fred Jr.
BLAIR: From talking to his sister and from what Donald himself has written, it seems that it was apparent really very early on that Fred Jr., nice guy, funny, lots of friends, but not a killer, which is what their father, Fred Sr., literally told the kids to be and Fred Jr. not so much, Donald, absolutely. MARTIN: Michael D'Antonio wrote another biography, called The Truth About Trump. D'ANTONIO: His father would tell his sons you're killers and you're kings and they were supposed to rise up in life as killers and kings and nothing was quite good enough. MARTIN: The Trumps were competitive. D'Antonio says they also had a flare for the dramatic. D'ANTONIO: His father was actually a pretty theatrical guy although his skill level wasn't as near what the sons became. Fred Trump loved to dress really well, to swan about town a little bit in Manhattan, and his mother was also the center of attention at a social event and loved to perform for people, telling stories and jokes. And I think that this is where Donald observed how effective that could be. So he'd grew into a young man who actually found theater and film to be his first area of interest. MARTIN: So much so that when Donald Trump was in his early 20s, just out of Wharton Business School, he thought maybe he'd like to be a Broadway producer. So he talked his way into co-producing a play called Paris is Out; it debuted on Broadway in 1970. D'ANTONIO: It got reviews of the sort that no one wants. One reviewer just said that he sat there and gaped at it and was neither moved to hate it or moved to like it, it was just there. But it did advertise itself with Donald J. Trump as a producer and it gave him I think a first experience with how to reach the public with a story and subsequently, I think he's kind of produced his own life and starred in it ever since. MARTIN: Producing that play was a risk and taking it was just part of being a Trump. Biographer Gwenda Blair says the Trump family was big into the idea and that if you could just believe strongly enough in yourself, if you trusted yourself enough, you could make anything happen — otherwise known as The Power of Positive Thinking, the 1952 book by the minister Norman Vincent Peale. BLAIR: The Trump family was very influenced by Dr. Peale. The parents went to his church in New York City. Donald and his sisters were married in the church, his parents were — funerals were in the church. PEALE: I've made a lifelong study of success, because it's something that all of us admitted or not would like to round out our lives with. BLAIR: And in Norman Vincent Peale's "10 Guidelines to Success," No. 1 was, and I quote, "Formulate and stamp indelibly on your mind a mental picture of yourself as succeeding. Hold this picture tenaciously, never permit it to fade." And I think we have seen that with Trump through the years and especially on the campaign trail. He's always successful at everything in his mind. He's always a winner and the only measure of anything is winning and losing and he wants to win. TRUMP: We will have so much winning if I get elected that you may get bored with winning. Believe me, I agree. You'll never get bored with winning, we never get bored. MARTIN: Here's Piers Morgan again. MORGAN: He'd always said to me privately and in public and in interviews, "You trust your gut instinct and you won't get far wrong." MARTIN: But trusting his gut has not always worked out, which leads us to Atlantic City, N.J., and a man named Steven Perskie. PERSKIE: I served from October of 1990 to May of 1994 as the chairman of the New Jersey Casino Control Commission. MARTIN: Perskie remembers [that] when Trump started making noises about investing in Atlantic City, local officials thought they had hit the jackpot. PERSKIE: At the beginning, it was, "Oh my goodness, here comes this major real estate developer in New York and he's going to enter the casino business, he's going to do so in Atlantic City and he's going to do it in a first-class way." And for the first six or seven years, he was a giant here. Then he may — has never acknowledged making but he did make a series of major and eventually catastrophic bad decisions. MARTIN: But we're getting ahead of ourselves. Let's start with what went right. Trump opened the Atlanta Hotel along the Atlantic City Boardwalk and then the Castle Casino in 1985. PERSKIE: So through the 1980s, his experience in Atlantic City was with those two properties which were successful in every sense. MARTIN: Then Donald Trump sniffed out another opportunity. He snatched up the new Taj Mahal Hotel and Casino at a bargain price, but he needed approval from the State Casino Commission to get another license. PERSKIE: Trump came to the Casino Control Commission, this was before I got there, and made a presentation that he wanted to buy and take over the completion and operation of the Taj Mahal, that he would do so by funding it in a fashion that was consistent with the successful funding that he had done on the other two properties and that everything would be fine. He didn't do that; he chose junk bonds. The terms of the debt were dramatic, several financial analysts at the time indicated that the market could not and would not sustain that kind of debt structure, but Trump insisted that it could and would. MARTIN: So Trump went ahead with it. And in April of 1990, he opened the Taj Mahal. Steven Perskie was there that day. PERSKIE: It was an incredibly exciting experience. MARTIN: Can you tell me more about that? Was there a ribbon cutting or something? PERSKIE: Oh my goodness, there was. There were, I don't know how many hundreds, there might have been maybe more than a thousand people. Many of them little old ladies who took one look at Trump and started to scream, "Donald. Donald." MARTIN: At a historic meeting of showbiz and big biz, music's magic man and the Midas mogul ran the media [gantlet] to open the world's glitziest casino. Donald Trump gave Michael Jackson a personal tour of his $1.2 billion extravaganza. PERSKIE: That was in early April of 1990. By July 4, six or eight weeks later, the hotel was in financial trouble. MARTIN: Did he — I'm sure this is beyond the scope of your regular conversations with him but at any point, did you talk to him about it or did you hear his public statements of why was he so convinced that the analysts were wrong? PERSKIE: Well the conversations that I had with him were later but the message that he was giving was, "I'm Donald Trump; I have never failed at anything and I'm not going to fail here and anybody who says I am doesn't know what he's talking about." When I got to the casino commission, which was in October of 1990, I walked in the door, the day I [was sworn] in and the staff was there and I said, "Glad you're here. The first thing you've got to do is to decide whether Donald Trump and his companies are sufficiently financially stable to continue to hold a license in New Jersey." MARTIN: For the record, at the time, was it just the Taj that was suffering or were his other two businesses starting to falter? PERSKIE: By the end of 1990, it was still just the Taj. The Plaza and the Castle were still OK. That changed rather rapidly over the next couple of years because the problems were so significant at the Taj that it wound up draining a lot of the assets from the Castle and the Plaza so that by the time the exercise got finished in the late '90s and the early 2000s, all three properties were unsupportable. MARTIN: Instead of pulling Trump's license to operate the Taj, Steven Perskie essentially put Trump on a financial performance plan to try and keep the businesses afloat. PERSKIE: So eventually in spite of our and his I guess best efforts, the project failed. MARTIN: Steven Perskie says Trump has never owned up to the mistakes he made in Atlantic City. PERSKIE: He blames the failure — his failure in Atlantic City on others, on the economy, on whoever. The fact is that it was his failure which he has never acknowledged. MARTIN: Steven Perskie says the bondholders got their clocks cleaned but they knew the risks. PERSKIE: On the other hand, the small businesses in the Atlantic City and New Jersey, South Jersey area that welcomed him were thrilled with the opportunity to do business with Donald Trump didn't assume that risk. Donald Trump portrayed himself as too big to fail, too strong to fail, too smart to fail so that if you were in business with him whether you were selling him meats for his restaurants or you were fixing the carpets in his hotel, whatever it was that you were doing, you were thrilled to get the business because it was reliable and you were counting on Donald Trump to be reliable. MARTIN: But you also believed that he was too big to fail because of the importance of those businesses to the economy? PERSKIE: No, I didn't believe that he was too big to fail. I thought that he was too smart to fail. I thought that before he would fail, he had the ability and he had the knowledge to take the steps necessary to prevent failure, that's what I believed and my belief turned out to be wrong. PHIL RUFFIN: I know that Atlantic City has been a disaster. My name is Phil Ruffin, I've known Donald for 20 years, we're close personal friends. MARTIN: Donald Trump was Ruffin's best man at his wedding and they co-owned the Trump International Hotel and Tower in Las Vegas. When I asked Phil Ruffin about Trump's time in Atlantic City, he made it clear he thought it was about investment. RUFFIN: I stayed away from it. We had plenty of opportunity to get in. MARTIN: You saw the warning signs in Atlantic City, why do you think Donald Trump didn't see them? RUFFIN: He did that, Rachel, before I knew him and, you know, at that time Atlantic City was booming. You know, he built the Taj Mahal and a couple others and the economy just went sour on him and he couldn't pay it back but he personally did not declare bankruptcy, the properties declared bankruptcy. And so I don't know. MARTIN: Do you think he would admit that he — that he failed at parts of those investments and has learned lessons from that? RUFFIN: You'd have to ask him about that. He's a brilliant businessman but sometimes you take on too much debt and you can't make the payments. And I think that was the case there. MARTIN: The whole Atlantic City Casino story is instructive because it illustrates how Trump's unwavering faith in his own judgment can create blind spots and acknowledging any failure undermines the public persona Trump has created for himself as a winner, a winner who can succeed where everyone else has failed. And that message has become a main theme throughout his political campaign. TRUMP: Nobody knows the system better than me which is why I alone can fix it. MARTIN: One year ago, Republican Party leaders never would have believed that Donald Trump would address the GOP convention as their party's nominee. STONE: Well make no mistake about it, Trump's nomination was a hostile takeover of the Republican Party. MARTIN: This is Roger Stone, a longtime Republican strategist and informal adviser to Donald Trump. Stone remembers meeting Trump in 1979 when Stone was working with Ronald Reagan's presidential campaign. STONE: Yes. He was even then larger than life. I mean, charismatic, tall, good looking, blunt, straight to the point, all business, great sense of humor though, and I came way saying, "Wow, what an incredibly attractive piece of political horseflesh." MARTIN: Donald Trump was focused on building up his father's business but he always kept tabs on politics and cultivated relationships with politicians from both parties. Stone says Trump was a Republican for most of his life with a couple of detours. He joined an affiliate of the Reform Party in 1999 and briefly considered running for president on that ticket. STONE: After Donald decided not to run in 2000, he switched his registration back to the Republican Party and he remained a Republican until ... George W. Bush became president. And then I didn't know this until recently but during the Bush presidency, he switched his registration to Democrat. And then after the Bush presidency he quietly switched his registration back to the Republican Party. Like many Americans, he's gone from being an establishment Republican to realizing that both parties are in it together, that there is a two-party duopoly and therefore this election is not so much Republicans versus Democrats as it is insiders versus outsiders. MARTIN: And Donald Trump has positioned himself as the ultimate outsider to the point where he has at times personally attacked key leaders of the Republican Party. I asked Roger Stone how he can repair those relationships if he wins. STONE: If his policies are popular, the establishment Republicans will come to him. Remember their major objective in life is getting re-elected and therefore they will be for whatever they think the people are for. So in Trump's case, if he can't make them see the light, he has to make them feel the heat. MARTIN: Piers Morgan says it's how Trump has operated his entire career, in business and now in politics. MORGAN: If you're with Trump, if you're supportive of him, he is incredibly loyal back to you. If you cross him, if you take him on, if you abuse him, he will fight fire with fire. He can be very, very effective at burying opponents. MARTIN: Donald Trump has buried his opponents in his campaign. He has even buried his potential allies leaving him virtually alone at the top of his presidential project. That means he will likely take all the credit if he wins and he will have no one left to blame if he doesn't. This was a special broadcast from NPR News on the question of character in the 2016 presidential campaign. It was edited by Jordana Hochman and produced by Gemma Waters, Julia Buckley and Samantha Balaban. I'm Rachel Martin.